The cover price is US$25.00. This book contains 106 pages. The time chosen for the interval between a shell firing and its burst is sometimes given less thought than it deserves. By carefully choosing the delay interval provided by the time fuse, it may be possible to produce undistorted bursts, with a higher level of safety. Reprint Information: Number of pages = 3. Download for free pp 217-219. Of those chemicals used in pyrotechnics (with the possible exception of charcoal) aluminum metal powders have the ability to produce the greatest variety and range of effects. Thus, mastery of the use of aluminum in pyrotechnics offers both a challenge and a reward. In an attempt to assist in achieving that mastery, this article presents information on aluminum metal powders and their use in pyrotechnics. However, the emphasis is on physical aspects of aluminum metal powders, rather than on aluminum chemistry. The subject of specific uses of aluminum in pyrotechnics has been covered by other authors, and numerous references to such articles are given in the last section of this paper. Reprint Information: Number of pages = 10. Download for free pp 220-228. The proper use of technical and scientific terms is fundamentally important for clear and effective communication. It is also a mark of a professional to use the vocabulary correctly. Toward that end, the following brief article is offered. Reprint Information: Number of pages = 2. Download for free pp 229-230. Fireworks Displays — Abnormally Dangerous Activity ? ? ? Most of the fireworks display industry is aware of the ruling of the Washington state supreme court, which declared the conducting of fireworks displays to be an abnormally dangerous activity. In part, that ruling was based on their considered opinion that, by their very nature, fireworks displays could not be performed safely. One ramification of declaring fireworks to be an abnormally dangerous activity is that in the event of an accident, negligence is no longer a consideration regarding liability. In legal parlance this is referred to as “strict liability”. Under normal liability, in order to win a judgment it must be shown that a defendant was negligent (i.e., failed to conduct himself as a “reasonable” person would have under the same circumstances). Thus, if a display operator and crew always do what reasonable persons would, they would not be negligent and would be victorious if sued. (At least this is true in theory.) However, under strict liability, about all that a plaintiff needs to prove in court to win a judgment is that they were injured. Obviously, this is a far easier task and a situation likely to have ramifications affecting insurance rates and a sponsor’s willingness to put on displays. Reprint Information: Number of pages = 4. Download for free pp 231-234. Lancework set pieces can be one of the most interesting forms of fireworks. If one uses high-quality lance formulas, skillfully designed lance figures, provides clever animation, or tells an interesting story, the entertainment value of lancework can reach the heights it should. This article describes the methods used by the authors to design, construct and display lancework set pieces. There are also short appendices written by C. Jennings-White, M. VanTiel, and R. Winokur, wherein they present their views on some points relating to this article. Reprint Information: Number of pages = 21. Download for free pp 235-254. Over the years the authors have had experience with government contracting from both sides: in selecting and monitoring contractors for the government and as holders of government contracts. In this article we would like to share some general information about contracting with the federal government and about contracting for fireworks displays in particular. However, readers are cautioned that there are some differences in the manner in which various government departments let contracts and then monitor those contracts. Thus there is no guarantee that the process, as described in this article, is completely accurate for any particular situation. Reprint Information: Number of pages = 2. Download for free pp 255-256. The terms electric match and squib are often used interchangeably in the fireworks industry. However, there are at least two good reasons not to do this, one technical and one legal. Technically, these are two different items both in terms of form and function. Legally, although both are Class C explosives (Explosives, 1.4g), squibs are on the BATF Explosive Materials List, which invokes all the regulatory requirements normally reserved for display fireworks, blasting caps and dynamite. Reprint Information: Number of pages = 3. Download for free pp 257-259. In late December 1978 more than 100 serious injuries were reported in eastern Kentucky, apparently the result of defective visco fuse. The defective fuse had been used by a manufacturer of M-80’s and other illegal consumer devices. These devices “exploded as soon as they were lit”, apparently while still being held in the hand. While the authors’ interests were peaked by this report, it was not possible to investigate the cause of the malfunctioning fuse because none was available for testing. Many years later, while discussing the accidents at the 1989 PGI Convention, Eldon Hershberger said that he had a small amount of fuse dating back to approximately that time, and the fuse had an unreliable burn rate. He stated that the fuse generally burned normally, but every once in a while the burning seemed to instantly advance ½ to 1 inch. He had purchased the fuse from a hobbyist supplier in the late 1970’s. This sounded like it might be the defective fuse we wished to have for testing. Eldon was kind enough to supply two short lengths for evaluation. Reprint Information: Number of pages = 5.Download for free pp 260-264. NOMATCH™ is a new system for igniting fireworks that replaces quick match with shock tube plus flame-to-shock (or electric-to-shock) and shock-to-flame attachments. 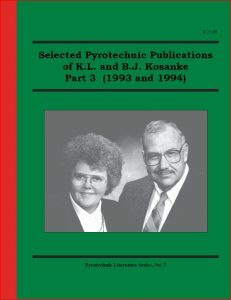 The system was introduced by B & C Products, Inc., with a press release included in the July 1994 Issue of American Fireworks News, an article in the July 1994 issue of Fireworks Business, and a demonstration and seminar at the 1994 Pyrotechnics Guild International (PGI) convention. There was considerable discussion, among the PGI convention attendees, of the potential usefulness of this new system in various fireworks environments. The safety and performance advantages of the system seem obvious. Below is a brief discussion of two low cost alternatives for electric ignition of shock tubing. For the most part, these are well known and commonly used methods; however, probably not among those in the fireworks trade. It is hoped that this information is interesting and possibly will aid in the introduction of this system. Reprint Information: Number of pages = 2. Download for free pp 265-266. There is a good deal of misunderstanding as to the role of the expert witness in our legal system. Because of this; because I think the subject is intrinsically interesting; and because no one else has chosen to present the subject in an article for the fireworks trade, I have decided to make an attempt at an explanation. However, it should be understood that I have not made a study of law or of our legal system. Accordingly, while I believe I am correct, I can only give my understanding and belief as to the proper role of the technical expert witness. Reprint Information: Number of pages = 3. Download for free pp 267-269. In addition to satisfying general curiosity, there are technical questions requiring knowledge of aerial shell velocity. For example, a calculation of how far down range aerial shells will have traveled at various times after having been fired from highly angled mortars requires knowledge of the shell’s muzzle velocity and its effective drag coefficient. In particular, the authors (along with Mark Williams) plan to determine the maximum horizontal range of aerial shells which burst after the normal time fuse delay. This study could be conducted empirically by firing different size shells from mortars at various angles. However, such an approach could be prohibitively expensive and time consuming, and it probably would not allow the examination of as many cases as desired. As an alternative, the question could be examined using a computer model of aerial shell ballistics. This would be relatively inexpensive and any combination of shell velocity, shape and mass; time fuse delay; and mortar angle could be considered. However, without verification using results from actual testing, the modeled results would always be at least a little suspect. Accordingly, the best choice is to conduct a number of field tests to verify the correct performance of the computer model, and then to model the cases of interest. This article is the first in a series, which will describe the down range study introduced above. Reprint Information: Number of pages = 6. Download for free pp 270-274. Strobe stars that flash with so low a frequency that they fall to the ground still burning. Color stars that burn so rapidly that they occasionally explode when a shell flowerpots. Rockets that fail to lift-off because their thrust is too low. Rockets that explode upon firing because internal pressures exceed the casing strength. Salutes that burn like fountains instead of exploding with violence. Flash powder that explodes when unconfined, even in small quantity. In each case, taking action to adjust burn rate should solve the problem. Depending somewhat on how they are counted, there are at least 15 factors that control pyrotechnic burn rate. A manufacturer that understands how these factors act to affect burn rate may better anticipate when product performance difficulties will occur. Also, such a manufacturer will be better prepared to modify product formulations to correct any problems that do occur. Each of the burn rate control factors act by affecting one or more of the following: activation energy, heat of reaction, and efficiency of energy feedback. In this paper, the 15 factors are presented, explained and examples given. Reprint Information: Number of pages = 14. Download for free pp 275-288. Muzzle breaking aerial shells continue to be a significant cause of serious injury for persons discharging display fireworks. The problem is greatest for manually fired displays, where the person igniting the fireworks remains in close proximity to the mortar. Over the years, many possible causes for muzzle breaks have been suggested. Unfortunately, most of these explanations are incapable of withstanding close scientific scrutiny, and there has been no published study that has tested any of the potential explanations. Without knowing the cause(s) for muzzle breaks with some certainty, it is difficult (or impossible) for a manufacturer of aerial shells to know what measures might be taken to reduce or eliminate the chance of their occurrence. Probably the best known characteristic of muzzle breaks is that they occur almost exclusively in the largest diameter (most potentially dangerous) aerial shells. Probably at least 90% of muzzle breaks occur in aerial shells 205 mm (8 in.) or larger. This is true, even though at least 90% of all aerial shells fired are smaller than 205 mm (8 in.). Thus any theory for the cause of muzzle breaks must account for this observation. The authors hypothesize that either setback or very small fire leaks lead to the occurrence of muzzle breaks, and that the dynamics of the propulsion of fireworks from mortars and the explosion of aerial shells is such that the chances for muzzle break occurrence is greatest for large diameter shells. In an attempt to test the hypothesis, a series of measurements were performed to determine the exit times of aerial shells from mortars and the times to explosion of shells after internal ignition. Results of these measurements are each somewhat surprising; they tend to support the hypothesis and provide insight into the mechanisms of aerial shell flowerpots. Reprint Information: Number of pages = 12. Download for free pp 289-300. The consequences of accidents can be devastating to those immediately involved and their relatives. However, the ramifications of accidents can extend much further. This is illustrated in what Richard Green (Idaho National Engineering Laboratory) has described as “The Four Horsemen of Our Own Apocalypse”, specifically: ACCIDENTS, INJURIES, LITIGATION, and LEGISLATION. In effect, this is a chain in which Accidents produce Injuries, which often result in Litigation, the notoriety from which helps generate pressure for more restrictive regulation (Legislation). With this view, it is accidents involving individuals that produce increased regulation, or at least provide an excuse for increased regulation. Because regulations not only affect those individuals having accidents, but also the fireworks community as a whole, the whole community has a stake in eliminating fireworks accidents. It is the hope of the authors that this article will contribute by stimulating thought and discussion of some basic Hazard Management concepts. Reprint Information: Number of pages = 4. Download for free pp 301-304. Reprint Information: Number of pages = 2. Download for free pp 305-306.